Home Endurance FIA WEC FIA WEC: 6-Hours of COTA – Half-Distance Battles Everywhere! 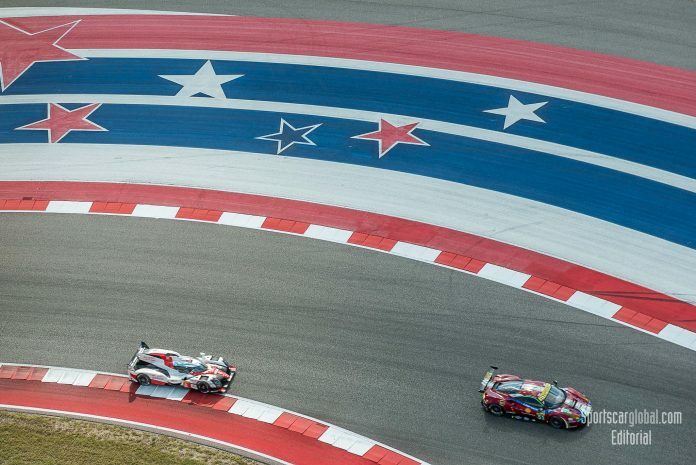 FIA WEC: 6-Hours of COTA – Half-Distance Battles Everywhere! 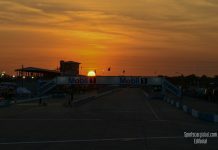 At half-distance, the final Lone Star Le Mans, 6-hours of Circuit of the Americas (COTA) is proving to be a classic, it is just unfortunate there are so few people in region on the ground to enjoy it, their loss. The Start was taken in very warm temperatures just shy of 31 deg C. and a track temp of 32.2. Given these temps the drivers are restricted to 80 minute stint durations. At midday in Texas Rubens Barrichello had the honour of dropping the flag and we were up and running. Having had an issue with its wiring loom prior to qualifying and hence not setting a time, the #25 Manor Oreca 07 was last to cross the line. 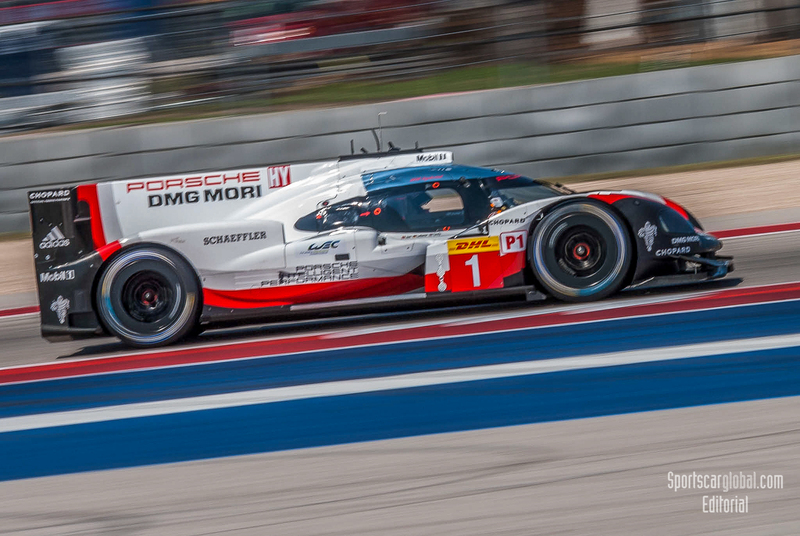 The action was appropriately fast and furious with initially the #1 Porsche 919 Hybrid leading the way from its sister #2 car and the #8 Toyota Hybrid TS050. 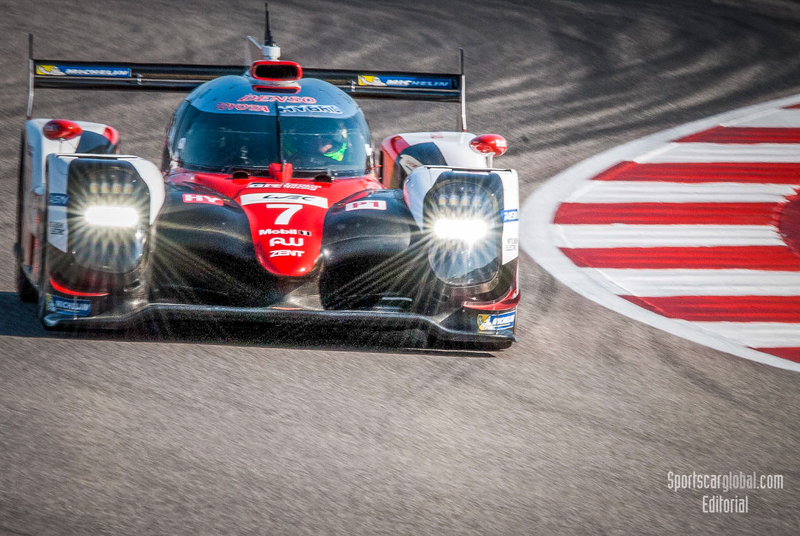 That did not last long, with the #8 Toyota utilising early new found pace to overtake the #2 for second place. Seb Buemi in the #8 Toyota was first to be given a final warning for Track Limits and reported chronic understeer at the T11 hairpin in his first stint. 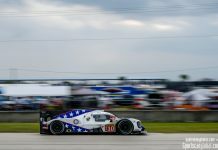 Toyota had rolled the dice at the first stop and did not change their tyres, which for a while left the Porsche 919s struggling to catch-up. But those cars may have been holding back early on and we witnessed some fantastic racing between Jose Maria Lopez in the #7 TS050 and Andre Lotterer in the #1 Porsche. It was spectacular to see with no contact, the Toyota on worn rubber was no match for the Porsche, but with the ability to deliver different boost strategies they swapped places a number of times before the experience endurance man Andre Lotterer pulled away. At half-distance in LMP1 the #1 Porsche 919 Hybrid of Jani/Tandy/Lotterer leads by 5secs from the #8 Toyota TS050 Hybrid of Buemi/Sarrazin/Nakajima (Sarrazin sitting in for Ant Davidson unavailable this weekend). Third place is in the hands of the #2 Porsche of Bernard/Hartley/Bamber. 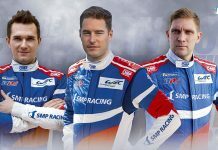 As long as the Toyota holds station with 14secs covering all 4 LMP1 cars then Porsche will struggle to deploy team orders to favour the championship leading #2. 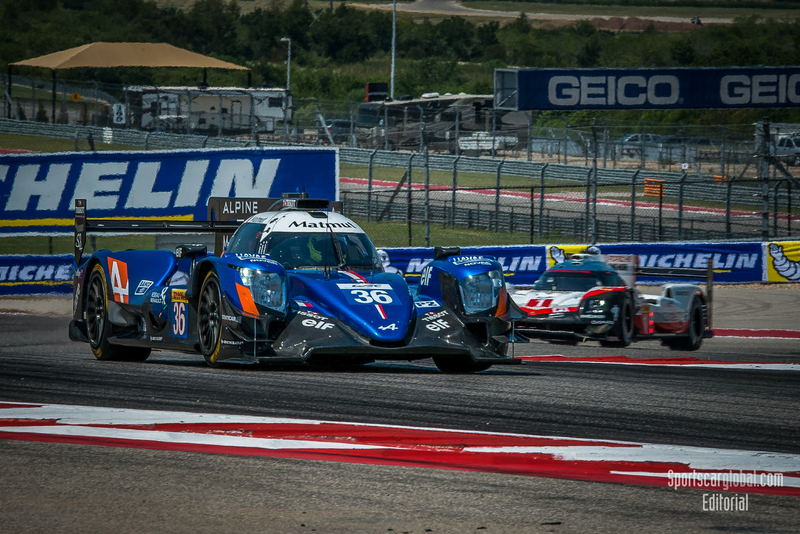 The competition is fierce behind in LMP2 with #36 Signatech-Alpine, #31 & #13 Vaillante Rebellions plus both Jackie Chan DC Racing Oreca 07s and the #26 G-Drive Racing in the mix. Any of these could come out on top, and given the bumpiness of the circuit we could well see some shaken attrition before the chequered flag. 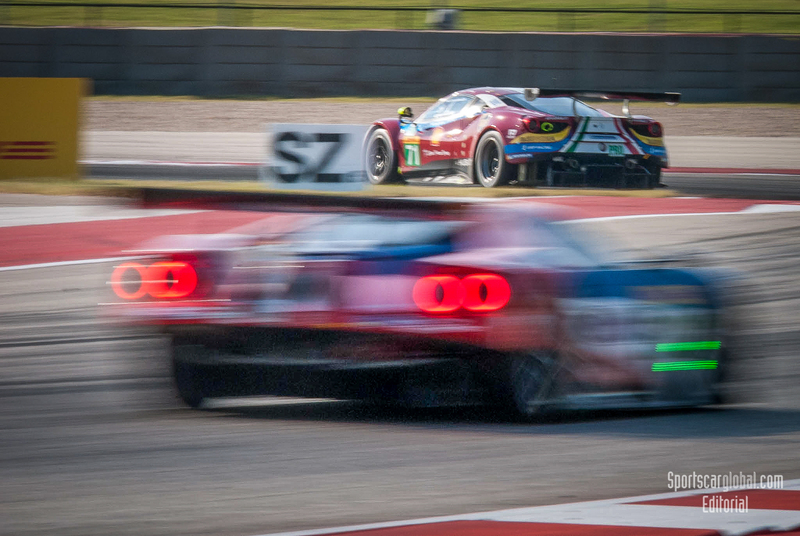 The early battle in GTE-Pro saw the Ford GTs drop like stones, to join the #97 Aston Martin Vantage at the rear of this field. 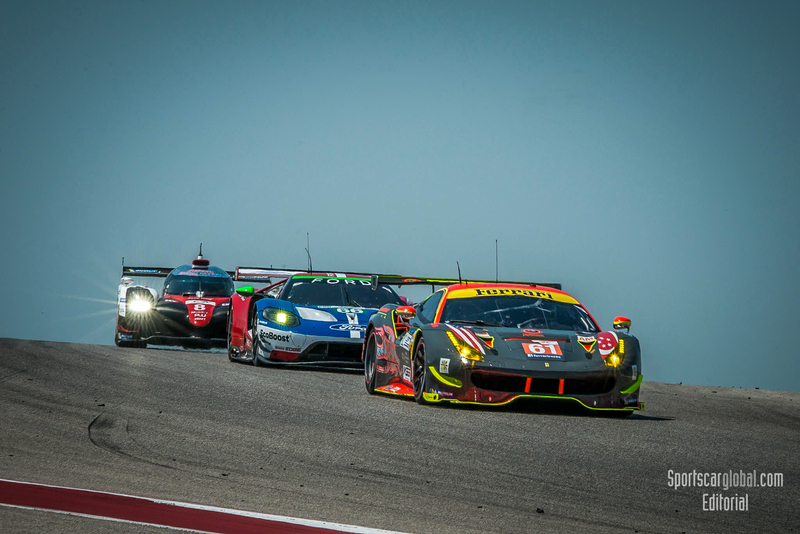 At the front the Ferrari 488s, Porsche RSRs and the remaining #95 Aston Martin Vantage fighting tooth and nail. As things settled out it was first the #71 AF Corse Ferrari to the fore, but by half-distance it was overcome by the #51 of a spirited James Calado. Third place is currently the fiesty #95 of Nicki Thiim and Marco Sorensen. Early accidental contact between the #61 Clearwater Ferrari and the rear of the #98 Aston Martin Vantage led to multiple stops to repair the rear diffuser (‘Bustle’) on the #98 GTE-Am Championship Leader. 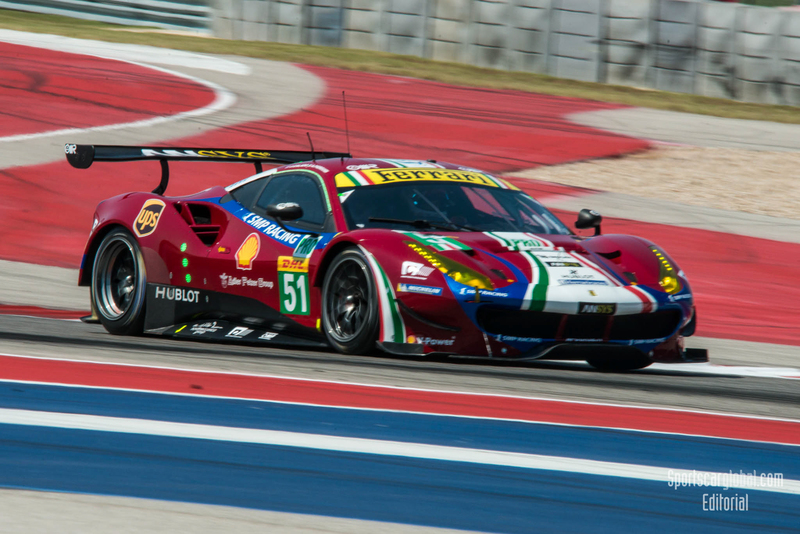 Both lie first #61 and second #98 in category with #54 Spirit of Race Ferrari in third. At Half-Distance the field currently run behind a Safety Car for repair to a Tech-Pro Barrier following an off for Mike Wainwright in the #86 Gulf Racing.